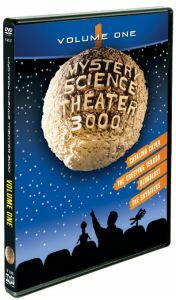 TV on DVD: "Mystery Science Theater 3000, Volume I"
The skydivers, Creepy Girl and a carnivorous carpet: Popdose tackles the first-ever Mystery Science Theater DVD set. Back in the long-ago depths of 2002, back when multi-DVD sets first began to grace the shelves of Best Buy and Circuit City — and back when there was such a thing as Circuit City — Rhino released the first volume of Mystery Science Theater 3000. For the show’s dedicated fans, it kicked off a pattern of regularly timed reissues that today has seen roughly two-thirds of the show’s ten-year run (not counting the copyright-violating KTMA episodes) made available. Thirteen years is a long time, and Rhino no longer releases MST3K on DVD, and so current license holders Shout! Factory have begun to reissue the out-of-print Rhino collections, taking the opportunity to fill them out with a few bonus features (always a weakness of the Rhino sets). And so Popdose MSTies Tony Redman and Dan Wiencek head back to the early aughts to (re)visit Mystery Science Theater 3000, Volume I.
Tony: I’ve always had a soft spot in my heart (and my head) for “beach party” type movies, and this one is pretty awful, which means it’s perfect for the show. A guy in a captain’s hat and an ascot steals an ancient scroll from a museum to sell to some crooks, some fighting happens and the scroll (in a waterproof tube, natch) falls overboard. The guy convinces the local scuba-loving teens to look for it in the guise of a treasure hunt, and much “hilarity” ensues. And it’s got Tommy Kirk and Lyle Waggoner and the crazy guy in the robe from Mork and Mindy and holy moley, Little Richard’s there too (described as “the only real talent in this movie” even though he was “hopped up on goofballs”)! Servo’s lovely “Creepy Girl” song is (I believe) the first chance for us to bask in Kevin Murphy’s beautiful singing voice. So this one hit just the right buttons for me (although they should have gone with the movie’s original title, Never Steal Anything Wet). Dan: Yeah, how could they pass up such a great title? This is a fan favorite, but despite the appearance of Little Richard (sadly past his prime at this point) and the wonderful ode to “Creepy Girl,” I’ve never found much to like in this movie or in what Joel and the Bots manage to do with it. My favorite part is actually the host segment where Joel tells the bots about the 60s, which veers into a resentful diatribe about not being able to go to Woodstock because he was only nine. Bummer, man. Extras: The excellent documentary The Crown Jewels, which was a history of Crown International Pictures, the source of all four movies in this collection, as well as the theatrical trailer. Extras: Apparently this movie didn’t have a trailer, so a trailer that was made for Screamfest is included. There’s also an extended trailer for The Creep behind the Camera, a movie about the making of The Creeping Terror and what a truly horrible person its director, A.C. Nelson, was. This actually makes The Creeping Terror even more unpleasant to watch. There’s also a Q&A about The Creep behind the Camera. And while the advertising says that the Q&A features MST3K performers Trace Beaulieu and Frank Conniff, that’s a bit deceptive since Frank is the moderator of the panel and Trace’s participation is relegated to a few shots of him sitting silently onstage listening to everyone else. Tony: I think there was one brief mention of Reed being Mr. Brady, but that was it. They did remark, however, on Reed’s shirt, which Tom Servo remarked was “so tight you could see his liver.” This was yet another retelling of the classic story The Most Dangerous Game, but the movie itself was pretty dull. It was nice to see the origin of Dr. Forrester’s mom Pearl again, especially considering how instrumental she became to the show later. 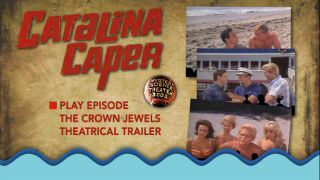 Extra: The aforementioned theatrical trailer. Tony: Ah yes, the Coleman Francis trilogy of movies (this one, Red Zone Cuba, and the classic Beast of Yucca Flats) were all delightfully awful, Mike and the bots just added another layer of fun on top. I liked how Francis added such a random assemblage of characters in this movie, including a lady on roller skates and a Scotsman in full regalia for no particular reason. For those of you who are used to the extras-packed volumes of Mystery Science Theater 3000 that Shout! Factory usually treats us to, you won’t find that here. Then again, this is simply meant to be a lower cost alternative to the original out-of-print Rhino set (which was going for quite a pretty penny for a while). If you don’t own the Rhino set, getting this is a no-brainer. Should you get rid of your Rhino version and replace it? That’s a tough call, because the one bonus that that set had and this one doesn’t was the original unriffed movies. If that doesn’t make a difference to you, however, go for it (and if this sells well then Shout! will be more likely to re-release other volumes of the old sets). Thanks for reading this review. Join Dan and I next time when we’ll review Mystery Science Theater 3000: Vol. XXXIV!